The United Kingdom includes the countries of England, Scotland, Wales and the constitutionally separate region of Northern Island, plus several small outlying islands - while 'Great Britain' - and this category - includes Southern Ireland. Great Britain is separated from the rest of Europe by the English Channel, but communication is much improved now that the Channel Tunnel provides a rail link for passengers and vehicles between England and France. Americans are the main overseas visitors to Great Britain because of its rich heritage, but is is also a popular holiday destination for many Europeans, Chinese and Japanese, who all enjoy its city splendours, unspoilt rural magic and the pleasure of clicking it permanently into their photographic memories. I live in England, so I don't have too far to travel to see these places. I wouldn't live anywhere else - except perhaps Switzerland, if I could afford it - because Great Britain truly is a "green and pleasant land". It has great character and charm, from cottages hundreds of years old and still going strong, to stately homes doing the same. This country is not without its modern cities and towns, of course, but many of these exhibit great historical interest. Speaking of which, this is perhaps the place to confess some likes and dislikes - so you can filter-out my bias, if you wish. I like countryside, character and olde-worlde charm. I like cities as well, but I like them to be clean, interesting, and I like to feel safe in them - even at night. (If this sounds unreasonable, remember that I live in England, and in most places here you still do feel reasonably safe.) I dislike some modern monstrosities of architecture - what Prince Charles refers to as 'carbuncles', I dislike litter, and I dislike constantly being accosted by peddlers, beggars, etc. (In England they are mostly selling "The Big Issue" and have a dog, but at least these work for their money and have a policy to be polite.) Like other Britains and Americans, I love it when the natives of other countries can speak English - because other countries are so much better at learning another language than we are. True, I do speak a bit of French, but I've proven that the French aren't as good at understanding this as they are at understanding English: which seems to prove the point that they should all speak English! I also dislike the fact that our government has seen fit to begin a process whereby Great Britain may soon become less than 'Great'. 'Devolution' has placed greater local power in Scotland, and Wales might eventually like to follow suit. The Scottish would say they were Scottish, the Welsh would say they were Welsh, yet the English would still mostly say they were British! Given that financial security within the whole of Britain is heavily dependent upon the English, this seems a trifle unfair. So if I begin to say I am English, rather than British, you'll know the reason why. We wish to maintain an identity as well! stay awhile in London and enjoy the scenes, the architecture, the grand buildings, the bustle, the museums, the theatres, the shops, the big hotels, and its throbbing vitality. So now, confessions over, lets get on with this small pastiche in 'Ed's Travels': travels on the 'wild side' by an Englishman! I thought it might be a good idea to start in Britain, although, to meet a global audience, this is not my top priority. There's always plenty of interest in London - but, like any other big city, don't drive in it or to it unless you really must. There's plenty of transport to choose from, from big, double-decker red buses of world-renown - we truly know how to save space on our small island - to the 'tube' (subway) or 'taxi' (cab). Yes, we do have our own language - and character! We even drive on the left, to prove it - but then we've being doing that for a long time. There's good reason for that, before you scoff: on horseback, a drawn sword is normally on the the right side for defending yourself against an oncoming highwayman - who, of course, is at least law-abiding enough to ride on the correct side of the road. And we don't forget these things quickly! Each time I drive to London something new discourages me from repeating it. Like the parking meter experience. I parked at a metered bay, inserted appropriate coins, but go no ticket. Rather than risk the same again at another meter, I scribbled a note which I left on the car explaining all - including the time at which my ticket should have expired. Surprise, surprise, I got another shape of ticket - and that cost a whole lot more than I anticipated for parking. They didn't even listen to my excuses. So - be wary. I wonder how much money they make this way? Then there was a more recent visit in which I put my trust in very detailed route instructions from a website linked from the hotel website where I intended to stay. These instructions began in my own road and would, it appeared, lead me to the very hotel door - or, at least, within several feet of it. (that I liked!) It told me, in terms of miles and even feet, how far to go down each road. It's funny how this instills a false sense of security and trust. I should have been a tad suspicious when their route from my house led me through side-streets I would never have chosen by choice, but since it soon linked with the obvious motorway route, I decided to trust it all the way. How naive. After all, how could a computer have local knowledge? But we should all give technology a chance and this was mine. London, seat of parliament, the place where the people's views are least appreciated and most ignored, and the place where lies the main home of royal residence - at Buckingham Palace. There are many traditional sights to see: 'Changing the Guard' at Buckingham Palace; 'feeding of the pigeons' in Trafalgar Square; 'running the gauntlet' of beggars in cardboard city near Waterloo Station (gateway to the channel tunnel link to mainland Europe). London bus tours are a good way of gaining your bearings - and the tube is a good way of losing them again. (Did you know there's a special breed of rats that have evolved in London's underground? But that's another story. Don't worry - they don't attack visitors if you stick on an English accent.) If you like walking, and get a good street map, then this is the best way to see London. It took me some time to realize that walking to the nearest tube station for a tube, and then walking from the drop-point to the desired destination was sometimes as far - if not farther - than walking there directly from the start point; and walking there directly is certainly much more interesting! London might be full of interest, but if you really want to get a real impression of England, or Great Britain in general, don't leave without visiting some other cities of historic interest. London is far from typical! But certainly stay awhile in London and enjoy the scenes, the architecture, the grand buildings, the bustle, the museums, the theatres, the shops, the big hotels, and its throbbing vitality. Then compare it with somewhere like Bath, where the pace of life is rather more sedate. That's the thing about England: the further you get away from the capital, the slower the pace gets. Try the counties of Devon or Cornwall if you really want to get into the slow lane for a while - and find unspoiled countryside and beautiful coastal towns. I thought that I'd better mention that I'd been to Buckingham Palace. Not everyone has, you know! Yes, it's true, before her Summer vacant ion, the Queen puts on her apron, rolls up her sleeves, gets her mop and bucket, then has a good scrub around to make quite sure that the State Apartments look really gleaming in readiness for her visitors over the next couple of months. I was one. Thankfully I was pre-booked, which made the queue situation rather more bearable. Otherwise, go early! You may have visited stately homes and seen some impressive furniture and decorations in some of these, but 'Buck-Pal' is something else again. Nothing - but nothing - could prepare you for this. It was designed to impress other royals and heads-of-state, so you and I can truly reckon to be impressed. There's enough gold here to make your Rolex look really tacky. Look as hard as you may, you won't find any sinking chairs or worn out drapes here. Or any faults. No sir! Everything here is just tickety-boo and oozing taste. Now, you might imagine that thick red carpets and a plethora of gold-leaf just about everywhere might look a bit over the top. Gaudy, even? Well, I have to say again, no siree! If you want to know how to display your gold with absolute taste and refinement, then this is the place to come. See also how to properly display your paintings, with examples from Rembrandt, Canaletto, Rubens and van Dyck, to mention but a few of the painters you might just have heard of. (They really are quite good!) Clearly the royals have learned how to handle such things with restraint; they've had a few centuries of practice in this country. My senses were boggled by the quality and finery of everything the eye could behold - no matter which way you looked. You might imagine that you only get to see the odd room or two, but I must hand it to Her Majesty, she has not stinted to give us a good impression and value for our money. You, too, can see the many state apartments, walk on that fine red carpet, see where royal guests arrive to go into the palace, where they meet the Queen, where they take supper and where they dance, where knights are dubbed (is this a sound practice? ), and see the actual sword with which they receive their congratulatory tap on the shoulders. You even get to walk through the gardens afterwards. What more can I say - except that such an experience is something to remember for a lifetime. So, take my tip. Do it now, while you can. 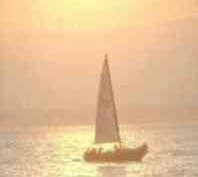 I doubt that the chance will go on for ever. Look out for leaflets on The Original London Walks. This is a company that provides guided walks throughout London from tube stations. You just turn up and pay your money to the guide. They tend to be great characters, nearly always amusing, and quite often actors. After all, with long scripts to learn and fill-ins between plays, this is a good filler for them. And it was only because they did a Saturday walk entitled Old Camden Town that I ventured to that part of London via the Northern Line of the tube. Emerging from the dim lighting of the tube station into Camden High Street was a real eye-opener. This, my friends, is the Land of Punk, imported from America. What fashion! Leather, spiky, pink coloured hair, gashed jeans, high, multi-buckled boots with 6-inch platform heals and soles... and that's just the men! First impressions might be the area looks a bit seedy - and it was the area in the news late 2003 concerning the -bin-bag murderer - but hey, you can't let a few little things like these keep you away from an area that has so much history - and such a great market! Follow the High Street, past the leather, punk music and clothes shops, noting, of course, the enormous figures stuck on the walls over the shops to signify their wares, and you cannot fail to come upon the market. Just realise that whatever bit of market you find first is not the entire market. The market is here, there and everywhere in Camden Town, and apart from being the largest in London and Great Britain, I suspect it might be the biggest in Europe. If you like to shop, you'll surely never drop in this one. You might well think you are in some Eastern country as you wander between the Persian carpets, jewellery, crafts, strange foods being cooked in frying pans a metre in diameter, and all this right alongside the canal. 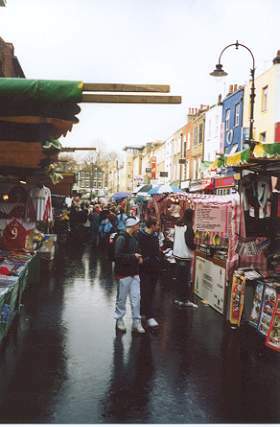 I tell you, for someone not at all interested in ordinary markets, where all you buy is cheap and not always cheerful, the Camden Market it something else. There is apparently some form of market all week, but Saturday is excellent and Sunday, I gather, so busy they even have to restrict Camden Town tube station to incoming people to avoid a crush. Does that tell you something? (Don't worry, there are other stations nearby to let you escape again.) The 'walk' was great for history, but I'll let you discover that for yourself. 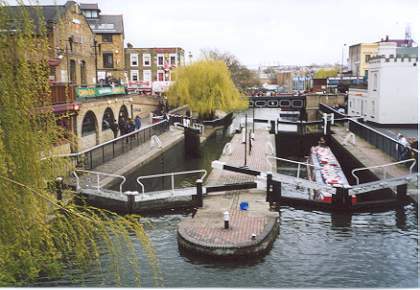 After the walk we decided to eat at a local pub near to Camden Lock. Great steak, but the sweet left something to be desired: cooking, mainly. Apple pie and custard was not how granny used to make it. The so-called hot custard was cold, the plate was cooler, and the apple pie was solid. One complaint later it came back with the plate a little warmer, the custard warm, but the pie still too cold to make much impression with a spoon. Two complaints later and a refund clutched in my custard-sticky hand, we left for the market. Somehow, apple pie had, by now, lost is appeal. We looked around the marked and H was sated on market goods any spoiled for choice in suede handbags and earrings. How fortunate we did not, in the end, also purchase a Persian carpet that was quite appealing. I just know she would have expected me to carry it on our following walk for miles down the canal bank to Little Venice, past the tall fences of London Zoo. How fortunate indeed, for we had already walked our little socks off in London. After tea on a long-boat at Little Venice - where many people live on the water - we tubed into central London for more weary walking. True, London walking is tiring, but you certainly see more and it helps you to get your bearings. I always recommend carrying a compass to go with your London map. Wish I'd followed my own advice after visiting Baker Street, for then I might have been walking the street in the intended direction. 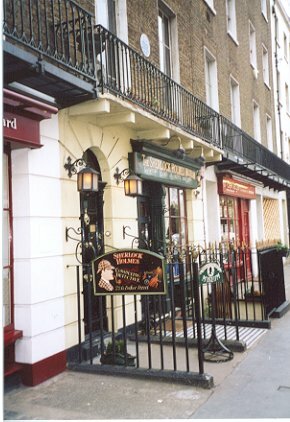 We did, however, locate Sherlock Holme's esteemed address (and memorial shop) in Baker Street. Just the place to pick up a dear-stalker and pipe. The previous day we had walked to Wobbly Bridge (sorry, Millennium Bridge), seen the outside of the Globe Theatre (where you can have standing room for a performance for less than a tour! 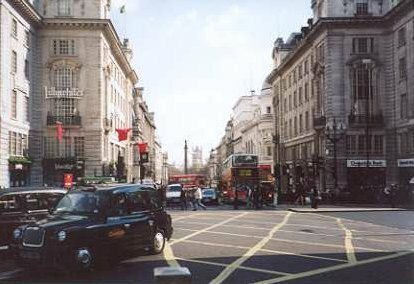 ), Regent Street shops, Downing Street, and goodness knows what else, including the London Eye, that fascinating wheel with its huge cabins, that 'wheel of fortune' (for its owners) that never stops; it just goes slowly enough for you to walk on/off. There is a great view to be had from the top of the wheel, so take your camera and look from Big Ben to Buckingham Palace, with the sparkling Thames beneath. 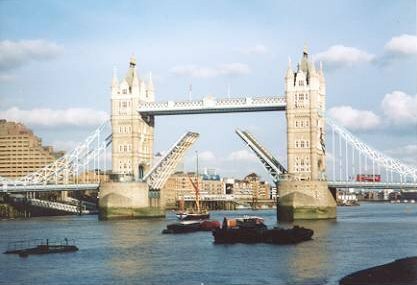 You can easily walk to Tower Bridge from here and visit Docklands and see where the rich maritime visitors to London park. (By the way, the Wobbly Bridge only wobbled when it was first built; they corrected that little design error. Now it only trembles beneath the constant footfalls, and short of a great storm, will probably seldom wobble again.) It's in incredible juxtaposition with the Globe, ancient and modern, alongside and across the Thames. A lot of water has flowed past this site of the Globe between Shakespeare and the present. I think the best general advice about London is to keep on the go as much as you can: and on the surface as much as you can. There's a lot to see: so best be where you can see it. Click the camcorder symbol above to watch a video about London, England. If you enjoyed reading the above article then you will probably also enjoy Irish Republic by Ed, and Lausanne, also in Europe, and our latest articles covering the Orinoco Delta, La Mata, Marbella and Beijing.